The pack “Adam Sandler Box Set: Click/Grown Ups/You Don’t Mess With the Zohan (3 DVDs) ” on DVD, UK version. You can find the films in English only in this pack. This version of “Adam Sandler Box Set: Click/Grown Ups/You Don’t Mess With the Zohan (3 DVDs) (UK Version)” was released in 2011. Le coffret “Adam Sandler Box Set: Click/Grown Ups/You Don’t Mess With the Zohan (3 DVDs)” en DVD, version UK. Les films dans ce coffret sont disponibles en anglais uniquement. Cette version de “Adam Sandler Box Set: Click/Grown Ups/You Don’t Mess With the Zohan (3 DVDs) (Version UK)” est sortie en 2011. 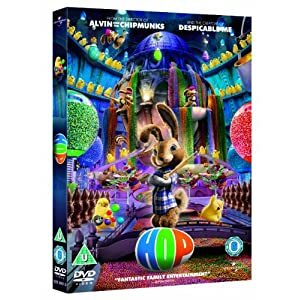 The film “Hop” with Limited Edition 3D Lenticular Sleeve on DVD, UK version. The film is available in English only on this DVD with Limited Edition 3D Lenticular Sleeve. This version of “Hop (UK Version)” was released in 2012. Le film “Hop” en DVD with Limited Edition 3D Lenticular Sleeve, version UK. Le film est disponible en Anglais uniquement sur ce DVD with Limited Edition 3D Lenticular Sleeve. Cette version de “Hop (Version UK)” est sortie en 2012. The TV show “Fröhlicher Frühling” on DVD. The TV Show is available on this DVD in German language. “Fröhlicher Frühling (TV show with David Hasselhoff)” was released in 2011. Le show télé “Fröhlicher Frühling” en DVD. Le show télé est disponible en Allemand sur ce DVD. “Fröhlicher Frühling (TV show with David Hasselhoff)” est sorti en 2011.